What is Cloudflare Firewall Rules? 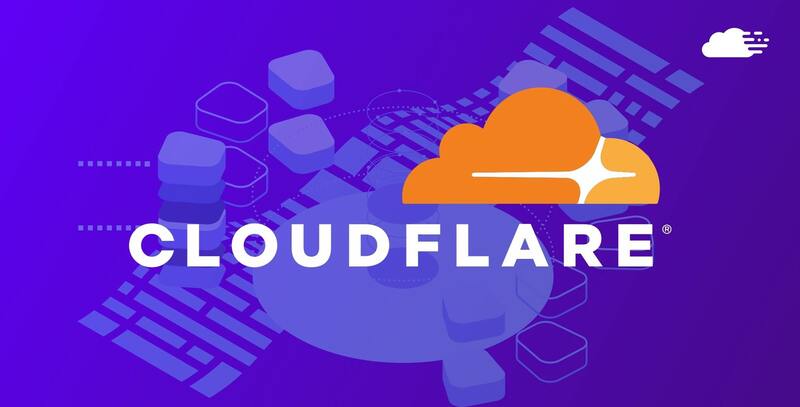 Cloudflare Firewall Rules is another firewall tools offered by Cloudflare which announced in October 2018. 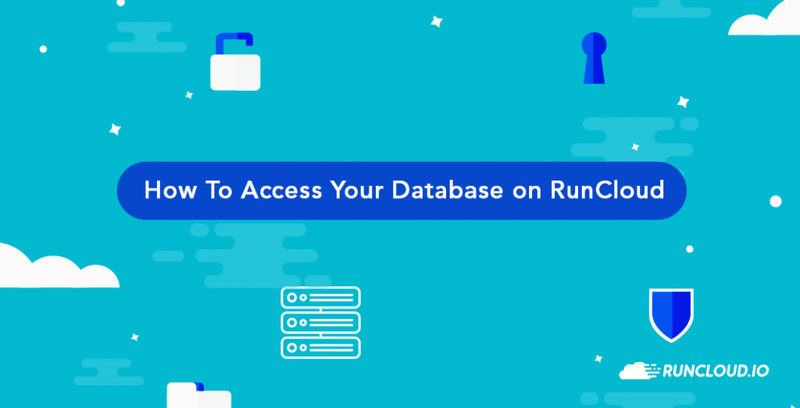 It is a powerful and flexible security tool to filter web application traffic. Cloudflare Firewall Rules is available for all Cloudflare plans. The free plan can have up to 5 active Firewall rules. A Firewall Rule consists of two parts: Matching and Action. 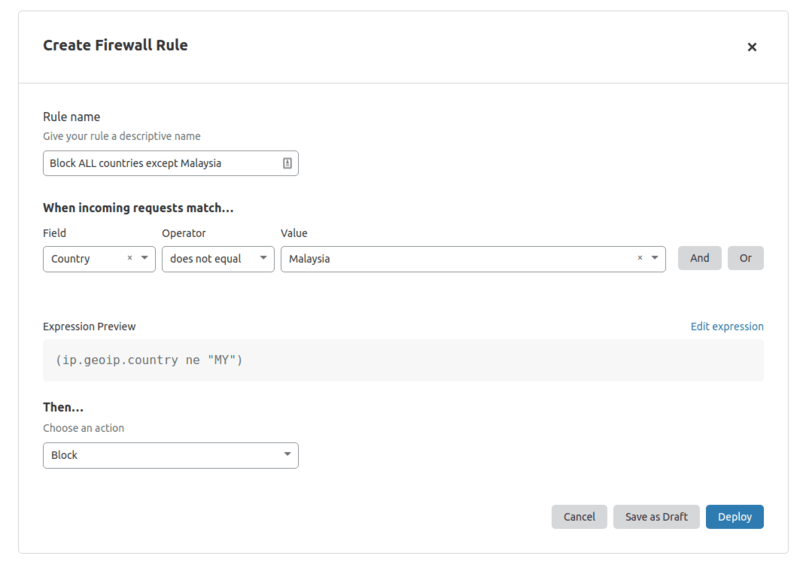 You can also order the firewall rules to override the default sequence which is based on the rule’s action. You can match a traffic to the HTTP request, including country, hostname, IP address, URI, referrer, known bots, threat score, and more. Known bots (cf.client.bot) is Cloudflare defined list of “known good bots”, which includes bots from Google, Apple, Bing, Linkedin, Pingdom, Yahoo… You are recommended to add cf.client.bot in an Allowed rule to avoid blocking good crawlers which could affect your SEO and monitoring. 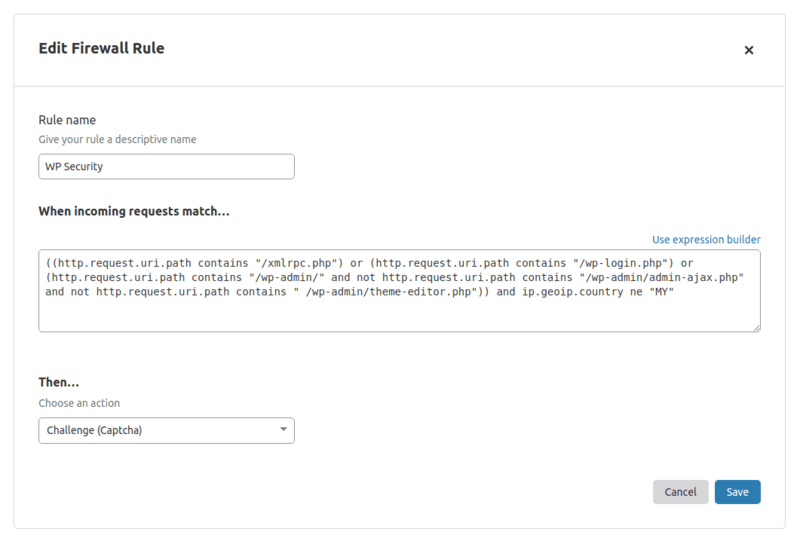 Regular Expression matching is supported for Cloudflare Business and Enterprise plans. 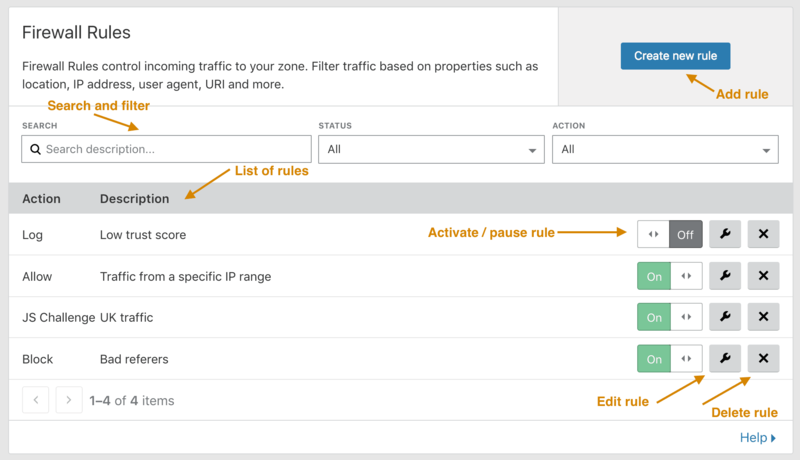 In this article, we will show you how to setup Cloudflare Firewall Rules through dashboard. You can also configure Firewall Rules through API and Terraform. You can easily do country blocking using Cloudflare Firewall Rules. Tip: Change the operator to equal to block only the chosen country in Value field. You can add more countries by clicking “OR” button. 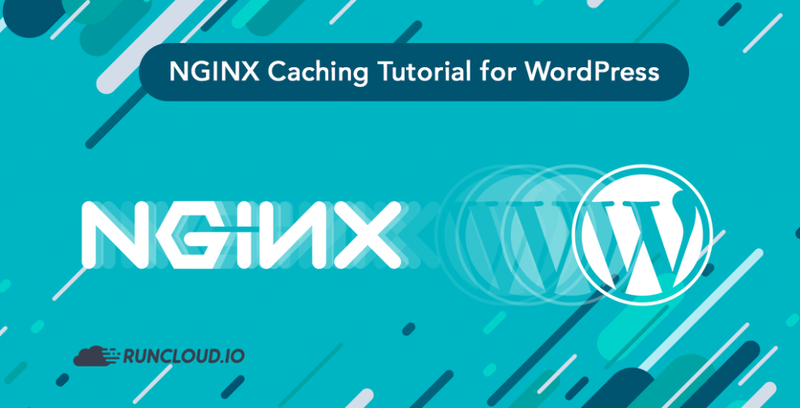 ((http.request.uri.path contains "/xmlrpc.php") or (http.request.uri.path contains "/wp-login.php") or (http.request.uri.path contains "/wp-admin/" and not http.request.uri.path contains "/wp-admin/admin-ajax.php" and not http.request.uri.path contains " /wp-admin/theme-editor.php")) and ip.geoip.country ne "MY"
This Firewall Rule will challenge any non-Malaysia visitor that try to access WordPress xmlrpc.php, wp-login.php, and /wp-admin (except admin-ajax.php and theme-editor.php). A simple rule like this could block most hack attempts to your WordPress website. You notice that no visual builder for this rule. It is because I use a complex (nested brackets) expression. Okay… This is a long bots blocking rule. It blocks any non-known-good-bots traffic with user agent that contain strings “crawl”, “bot”, “spider”, plus a few custom user agents. You can use Visual Builder to update a Firewall rule that is created using Expression Editor, provided you do not use nested brackets in the expression. Does Your Cloudflare Firewall Rules work? You have configure and active your Firewall rules. Do they work as expected? You can check the Firewall Event Log (Firewall > Events) for the list of firewall events (allow, challenge, block) and their details. Take note on the challenged and blocked events. You do not want to mistakenly blocking good traffic because of a wrongly configured Firewall rule. 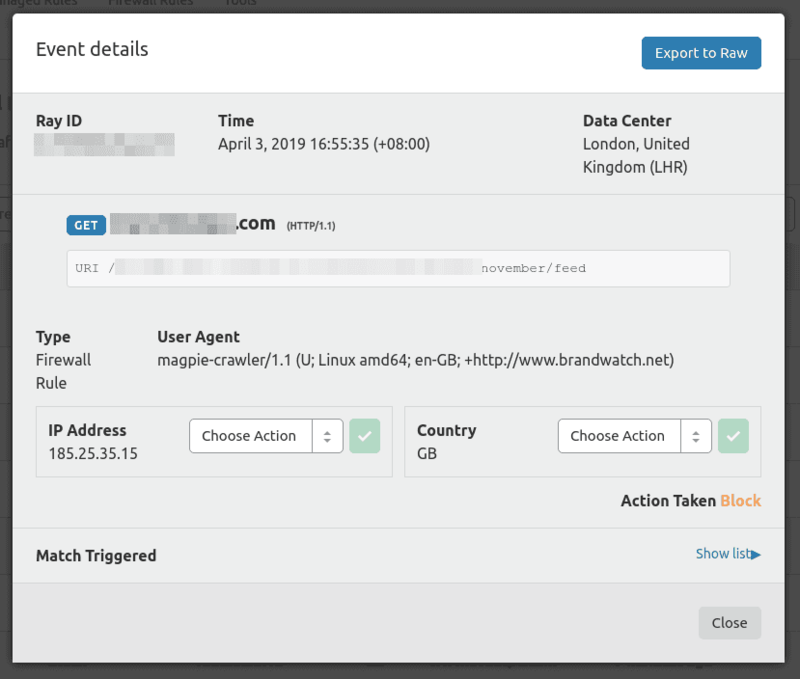 In this example, Firewall Rule blocks “magpie-crawler” bot with IP address “185.25.35.15” (United Kingdom) when it tries to access a post’s feed. In this tutorial, you have learned what is Cloudflare Firewall Rules and how to configure it to filter traffic and protect your web application. You also learned about Expression Editor for writing complex firewall rule. I hope you find this tutorial helpful. If you have any question, please add in the comment below. How do you use Cloudflare Firewall Rules?